Finding support for your weight-loss efforts can mean the difference between success and failure. Build your team with these ideas. If you don't have a weight-loss support team, use these strategies to create one. If you do, take advantage of your team's help and let them know how much their support means to you. According to research, having friends or family members who are supportive of your healthy eating and exercise goals is important for long-term weight-loss success. Emotional: A shoulder to lean on when you're feeling discouraged. Practical: Someone to watch the kids while you exercise. Inspiring: An exercise partner who encourages you to get out and move on those days when your favorite TV show seems like a better option. Tell your family and friends that you would appreciate their help, and let them know specifically how they can help you. For example, you might ask your partner to walk with you and your best friend to be there when you need to vent. You can also expect some unsupportive behaviors — it's not uncommon for a partner or other companion to feel threatened as you lose weight. Your mother may feel hurt if you don't eat her famous dessert, or your friends may beg you to skip a workout to go out for pizza. Remind your loved ones that while you're changing your lifestyle, you're not changing your feelings for them. Give them specific ways to help you reach your goals and share your journey with them. Consider forming or participating in a weight-loss group. 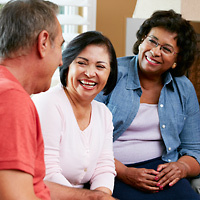 Ask friends, family members or co-workers to join you on your weight program to create your own support group. Or you may benefit from a support group led by a professional, such as a dietitian or certified health coach. Stay in touch. When we overeat, it's easy to feel ashamed and isolate ourselves. But support can be crucial in getting us back on track. So answer those phone calls, emails and texts, even when you're feeling down. Recognize the importance of give and take. Express your appreciation for support and be ready to return the favor and help others achieve their wellness goals. Learn who is best in what role. Maybe you thought your best friend would be a good person to vent to, but your friend is going through a tough time. That friend may make a better walking partner instead. Be open to learning who can support you in what manner: emotional, practical or inspiration. Find a partner. Find a co-worker to walk with or a friend with whom to plan or cook healthy meals. Join in. Take part in neighborhood events, community organizations, local exercise classes or active family get-togethers. Making lifestyle changes can be challenging, so find a support team to cheer you on!